A GUARDIAN BEST BOOK OF 2017 'To me, home cooking means having fun with great ingredients without having to spend a fortune. It means spending some time, but not all the time, cooking nourishing flavoursome food. This book includes all my kitchen essentials and they are delicious and totally do-able.' This inspiring guide for the home cook is about enjoying good food any day of the week. Thomasina Miers, founder of Wahaca and Guardian weekend cook has collected her most-loved recipes; recipes that she has fed her friends and family at her always busy kitchen table, recipes made up of family classics or food inspired by her travels and her favourite food-writers and chefs. And she has made these gorgeous recipes achievable, time-friendly and fuss-free. There are irresistible recipes ranging from marmalade & poppy-seed muffins to a show-stopping seafood paella, a mouth-watering Mexican crab mayo to picadillo, the crispiest ever chicken thighs (which she makes for her children) to her upside-down rhubarb cake. 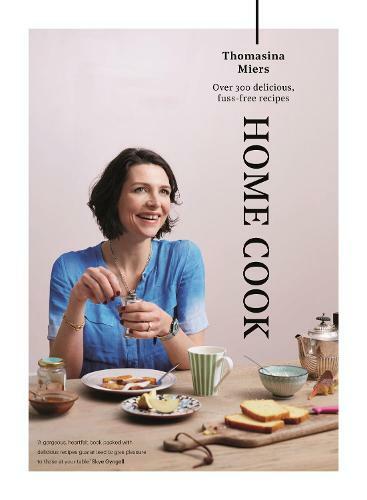 She includes simple recipes for making the perfect poached egg, an immaculate short-crust pastry or a cheat's guide to Sunday roasts. And every recipe includes a follow-up meal idea so that ingredients or sauces can be repurposed and your week and your food shop get that little bit easier. Bursting with imaginative ideas, big flavours and personality, Home Cook includes 300 recipes and beautiful photography throughout. Founder of Wahaca ... anyone for tortillas?